Happy hump day! I have exactly one week until I go back to my job as a middle school teacher and I am attempting to get back into my “regular” routine which is bittersweet. I love my job, but I love being home with my son even more, but the bills won’t pay themselves, so I am going to make the most of my last week of vacation. Last week I was tagged on Instagram in the #coasttocoastchallenge, Coast To Coast Central is a fabulous fashion blog that you need to follow! Every Tuesday and Thursday they have a nationwide or “coast to coast” challenge where you are given ideas or inspiration on what to wear. I love this, because I know I get tired of wearing the same things over and over and love having to think outside the box when getting dressed. To participate you simply post your picture on Instagram and tag #coasttocoastschallenge, I would definitely follow them on IG, @c2c_central so you can get the guidelines for each week’s challenge. Yesterday’s challenge was inspired by the song “Gold Digger”. I loved looking at all of the pics of how people interpreted the challenge, lots of gold, glitter, and glam! 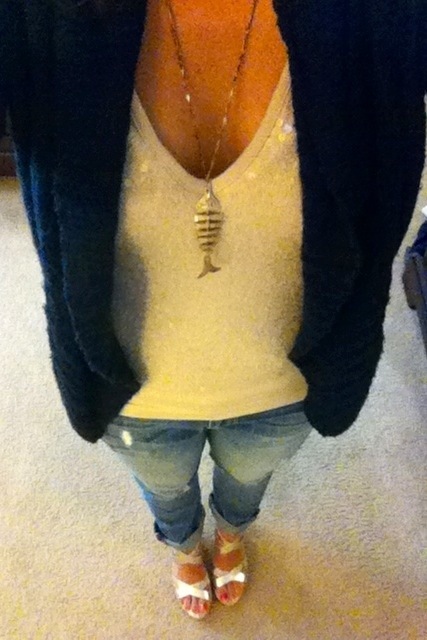 Navy Cardigan: TJ Maxx, bought last fall for $12.99! 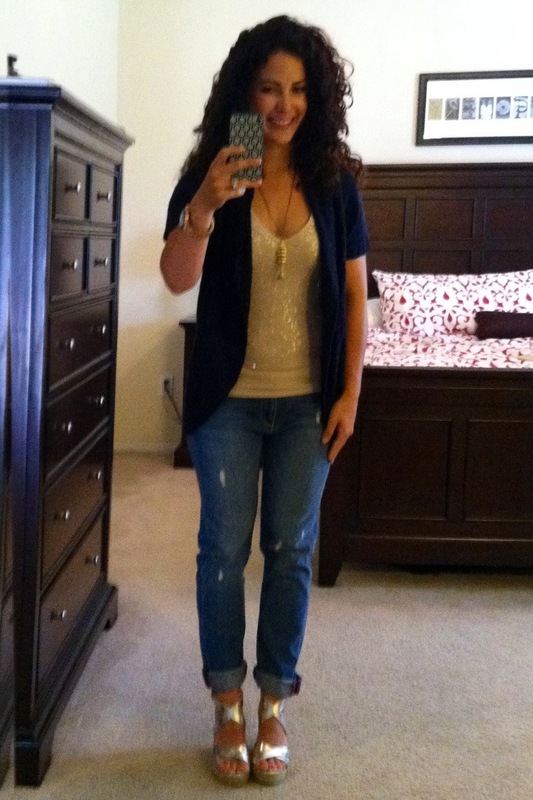 Sequin Tank: Bebe, I have had this for at least five years. I know I wore it on NYE and got it on clearance. I am not a big fan of Bebe, most items are crazy expensive and the sizes seem to run small. I normally wear a small everywhere, but I always have to wear medium tops from Bebe. I know this is silly, but no one likes buying bigger sizes! Distressed Boyfriend Jeans: Paige Premium Denim (Lydia) from Nordstrom Rack, $41.80 on clearance from $209! I just bought these on Monday. I could not believe my good fortune. I already love these jeans! I like the light wash and fit. I am thinking of all the different ways I can style them. Gold Wedges: Banana Republic bought this spring $30. I am so glad I bought these cute and comfy shoes. They are super versatile and go with almost everything! Fish Pendant Necklace: inherited from my grandma. I like this funky, statement necklace. It isn’t something I would normally wear, but I love it! Rose Gold Watch: Badgley Mischka from Costco, Christmas gift. I am still wearing this watch. The gold is starting to fade on the back of the band and so the hunt for a new watch has begun! This was my interpretation of “gold digger” for the Coast to Coast Challenge on 8.6.13. I hope some of you participate in the challenge tomorrow, not sure yet what it will be, but it would be fun to see some of my blogger friends and friends on Instagram try it! love the picture………… you look good. 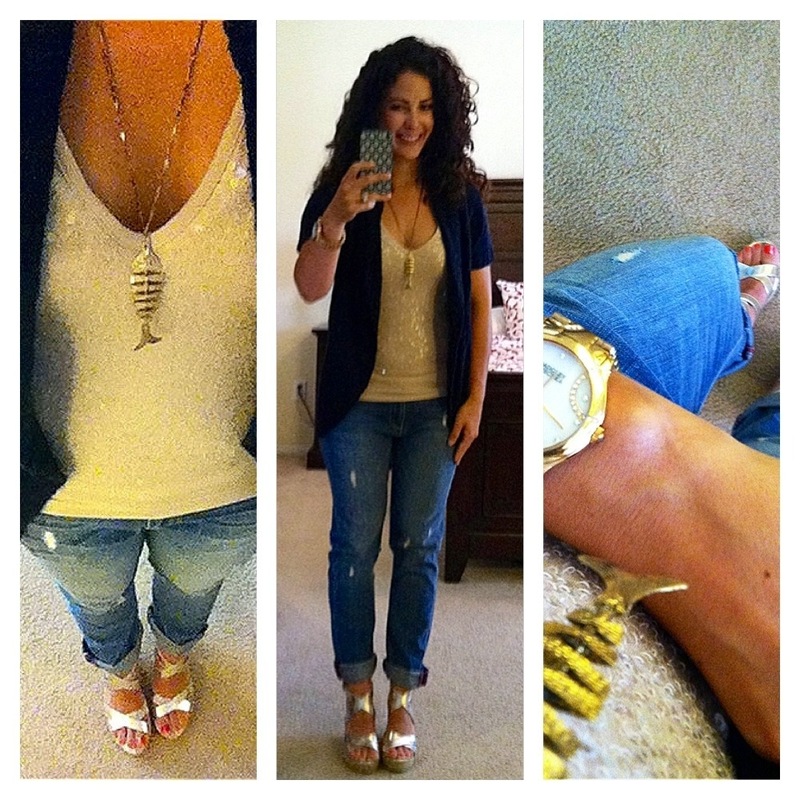 Great outfit, I love that fish necklace! Thank you! My grandma had great style! Thanks doll! I totally agree with you! Shoes can completely change your look. lovely accessories, they are so important in each outfit! Gotta love a great deal – brava!